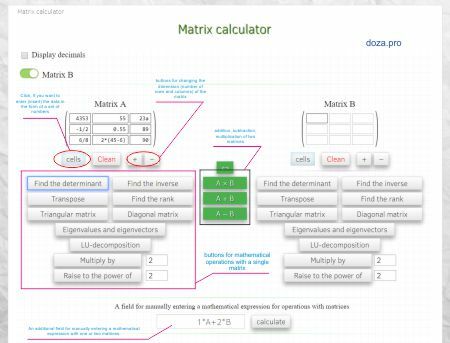 Matrix solver online allows you to perform mathematical operations with matrices online, step-by-step. Using matrix calculator online, you can perform the necessary calculations with matrices, resulting in the desired response and a detailed solution sequence. Matrix solver performs: matrix subtraction, matrix multiplication, transpose matrix, determinant of a matrix, rank of a matrix, and perform other operations with matrices. For all calculations, the answer provides explanations and references to the necessary theory. How to use the Matrix calculator is indicated in the tabs below. Additionally, at the end of the article, for convenience, there are links to materials on the Mathematics course "Matrix". Using our matrix calculator, you can perform the necessary calculations with matrices, resulting in the desired answer and a detailed solution sequence. The matrix calculator allows you to perform operations with a single matrix or solve complex expressions with several matrices at once. Fill in the fields for the matrix elements and click the corresponding button. Use the plus and minus keys to select the desired matrix size. If you need a non-square matrix, then just leave unnecessary cells empty. Click on the button with the name of the required mathematical operation or in manual mode enter the mathematical expression in a special field. Values in the solution results can be dragged with the mouse to different fields. For example, the resulting matrix can be dragged onto the source data field, for further resolution.